Costa Rica Vacations > Why Choose Us? There are many options out there, so this is a popular question and an important decision. While weighing your options, it is important for you to formulate an opinion based on real factors such as reviews, certifications, recognitions, location of services, services provided and a variety of other factors. The following is a list of benefits and reasons to reserve your Costa Rica vacation with us. We live and work in Costa Rica and are experts in travel planning. We visit all partner tour operators and hotels annually to ensure we have the latest information. We also verify the highest safety standards, certifications and insurances are up to date. Through years of experience we know who to work with and more importantly, who not to work with. You will receive 24/7/365 travel assistance when you are here in Costa Rica. We are a local phone call away at all times. Common problems we solve or assist with include coordination and return of luggage when it is lost by airlines, coordination in the return of forgotten items at hotels and on transfers, assistance in finding medical care when needed, modifications to itineraries when emergency situations arise, point of contact for friends or family members, coordination with the Embassy for lost passport issues. This really is the tip of the iceberg on situations we have assisted our clients with, but should shed some light on the type of services we provide when you are in the country. While we could branch out to other countries, we have not. Our efforts are concentrated solely within Costa Rica, which makes a big difference. We believe in providing honest, accurate and current information from the very beginning. We have a “no fluff” policy for hotel and tour descriptions, which means that what you see is what you get. The dynamic itineraries we utilize include real photos, GPS maps, accurate descriptions and relevant information. If you click on the various links of your itinerary page, you will find a wealth of information including everything from packing suggestions to expected drive times. When you reserve your vacation package, you will receive the Pacific Trade Winds service package. This includes personalized service, Costa Rica Pre-Pack (1 per group and includes: waterproof map, luggage tags, contact cards, wildlife guide, travel tips), VIP Airport Greeting, 24/7 in-country emergency assistance, Costa Rica Preparation Essentials email series, unlimited toll free assistance, unlimited email support, 4 point confirmation and reconfirmation reservations system = smooth sailing vacation. All of our vacations are private and that means you have the flexibility to choose exactly what you would like to do. Our network of partner providers includes nearly 700 hotels and well over 1,000 tour choices. With such a wide variety of options, you will never be limited and will always be able to create your perfect vacation. We believe in providing honest and fair pricing. There are no strings attached. When we provide a price, it is the final price including all current taxes and fees associated with the items listed in your itinerary unless otherwise explicitly noted. While we do not include rental car insurance (as this is an agreement that must be made between you, the rental car agency, your credit card company, and the insurance provider), we will always inform you of the price of the CDW insurance directly on your itinerary so you know exactly what to expect to pay. We always provide the best available rates and recommend ways to save money. This includes optimizing your routes, transportation methods and applying any and all discounts available. We often have exclusive contracts with providers for promotional rates, free nights or added value benefits such as free meals or complimentary transportation to activities. There is a comprehensive summary of what is included on all itineraries we send, so you will always know exactly what you are reserving. Your itemized itinerary includes current sales and turismo taxes (13%), toll free English and Spanish spoken customer service, and credit card acceptance fees (which in Costa Rica averages 8-10%). These items are typically not brought up until you sign the official authorization slip (unfortunately in many cases this is when you are already in the country and have utilized the service, leaving you little to no leverage) and can cost as much as 25% of your total trip. Our rates include all of the aforementioned as well as all of the services that we provide. Better Business Bureau: A+ rating. TripAdvisor: Average rating of 5 stars. TrustLink: Average rating of 5 stars. TripAdvisor Thread Search Feature: Hundreds of reviews if you take the time to read all of the individual threads. Google Search Feature: Hundreds of reviews from various sites. 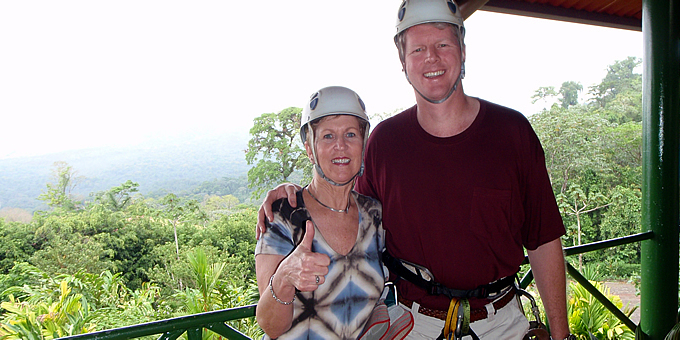 Costa Rica Guide: We perform all customer service and vacation planning for the clients of our friends at CRG. We are certified and in perfect standing with the following boards and bureaus. Costa Rica Tourism Board (ICT), license# G-2386-2009: This is the official government tourist board of Costa Rica. The United States department of State advises to only use ICT certified operators. Better Business Bureau (BBB): We are registered with the Better Business Bureau via our satellite office in the United States. The purpose of the BBB is to provide a platform for consumers to research the business ethics of companies via a third party resource. Costa Rica National Chamber of Tourism (CANATUR): The National Chamber of Tourism is not government regulated, but is heavily involved in forward progression and sustainable tourism practices. Members of this chamber must meet criteria designed to ensure the business practices ethical and sustainable business operations. Since 2007, we have assisted thousands of satisfied and happy clients in planning their perfect vacations. If you checked on the review, board and bureau sites, you know we are a reliable, safe and secure business to deal with. On top of this, we provide secure, no-nonsense payment options. When you consider all of the factors listed above, you will see that we take pride in our work and provide outstanding customer service for a smooth, safe, stress free vacation. You will be informed, prepared and know exactly what to expect. Our four point confirmation and reconfirmation system will ensure your vacation goes seamlessly and we will be here if you have any questions or require assistance. We sincerely want your vacation to be your experience of a lifetime! We hope this has shed some light on why to choose us for your Costa Rica vacation. If you have any questions, please do not hesitate to ask. We are always happy to help in any way we can. To do so, you can call toll free, 1-866-853-9426 or send us an email.